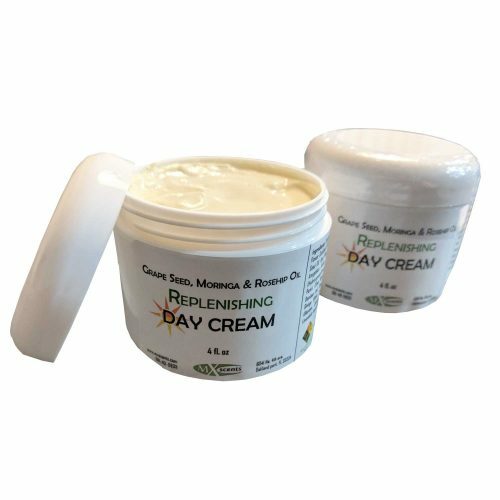 Short Product Description: Our Grape Seed, Moringa and Rosehip Oil REPLENISHING DAY CREAM is an incredible companion for your skin. 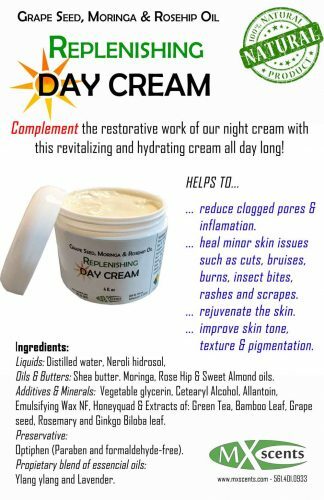 It has so many healthy components that your face will feel the extasis of a treat being delivered to your skin on a daily basis. Moringa and Rosehip oil, plus a mix of almost 7% of Bambu Leaf, Green tea, Grape Seed, Thyme and Olive Leaf are just some of the miracle workers that will take over the “I feel good” quality of your skin by moisturizing and hydrating it, and providing all the nutrients that mother nature so generously provides. Try it today. You will not regret to start walking this healthy path! Do not pollute your skin with dangerous chemicals. 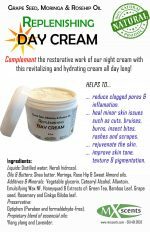 Renew it with a fresh & healthy cream! For better results apply before bedtime for at least 2 weeks. 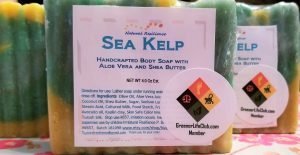 Ease minor skin complaints such as cuts, bruises, burns, insect bites, rashes, scars, scrapes and fine lines.